the boxes are officially taking over! b called this morning to see if we can get the truck today. our house is so full of crap that we can barely move, let alone clean anything. the last few days of the moving process are the suckiest. all the stuff you didn’t want to do finally has to be done. then you have to haul all of your stuff into a truck. say good-bye to a bunch of people you love and then take it all back out. fun! i just love winston sitting, like a good boy, in the midst of clutter and chaos. good buddy winnie. yesterday i tackled the basement. i think i did at least 8 loads of laundry, packed all of our clothes into trunks and trash bags. cleaned all our bedding. organized all the stuff that needs to be moved into one central location. swept. took out a bunch of trash. took three trash bags of clothes to big brothers & big sisters. took 4 boxes of books to half price books. luna is not amused by all of this. but will keep quiet as long as you leave the front door open so she can lay in her favorite spot. 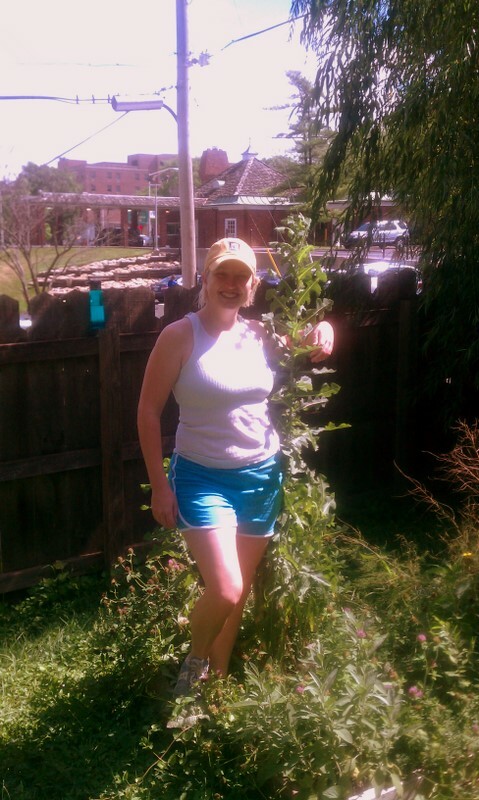 this morning i finally tackled the monster dandelion. we are master gardeners. well, that is pretty much all i have to say. my prize today will be brad’s birthday celebration….so until then it is mowing, cleaning, packing and doing my best to stay in a good mood about it all. talk to you people soon. i love the winnie pic! and lunars!